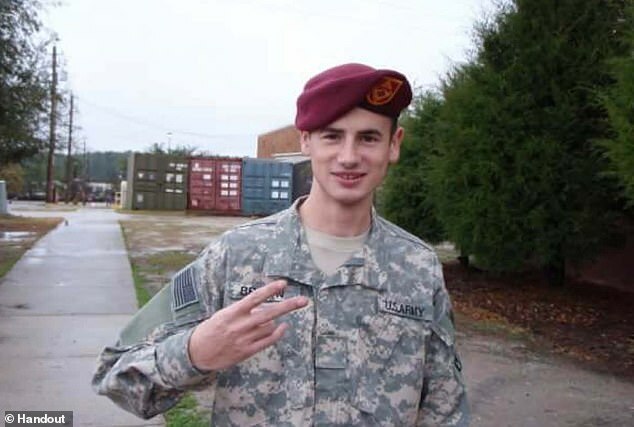 The family of a soldier who died from a single gunshot wound to his head in an Afghanistan watchtower in 2008 say he may not have taken his own life, as the military claims, and told them that he thought he would be killed two weeks before he was found dead. 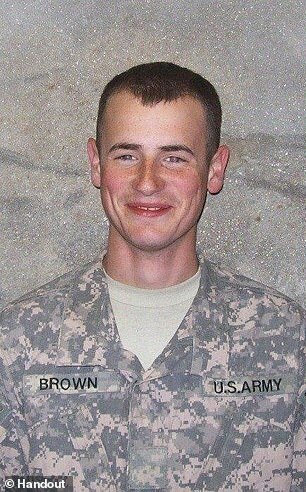 Matthew Warren Brown, 20, was found dead from a single wound to his right temple on the morning of May 11, 2008, at the forward operating base in Asamabad. 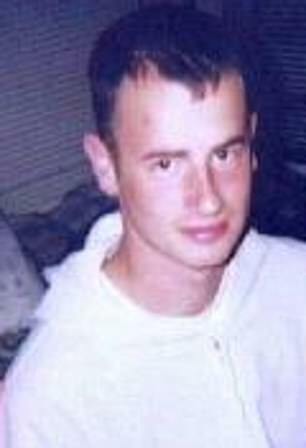 His death was ruled a suicide by the military but his family say he did not take his own life, as claimed, and predicted he would be killed because he had tried to get out of a drug ring that was being run on-base by a ‘thug’ sergeant. In an investigation by Vanity Fair published on Wednesday, it is revealed that two weeks before he was found dead, Brown confided in his mother during a visit home that he no longer wanted to be in the ring but was frightened he would be killed to stop him telling anyone about it. His role in it was to smuggle drugs from Pakistan onto the base to be sold to soldiers who used them to cope with the brutalities of the war. He himself was taking Valium and had enough in his body when he was found dead that it would have been impossible for him to shoot himself because he would have been so incoherent. When his body was found, he was still breathing. There was blood coming from his head, brain matter on the ground, and he was sitting slumped over his rifle. The sergeant called for help but Brown died minutes later. He had been seen alive at 6am, by the soldiers who he was taking over from, who thought he seemed doped up. On his way to the post, he encountered another soldier who thought he was drunk because he was so out of sorts. Despite their concerns, which they reported in statements to the CID after his death, he was allowed to stay in the gun tower alone. Between around 6.10am, when he was seen making his way to the tower and 6.25am, when he was found by a sergeant who had brought him breakfast, is when he died. In the hours afterwards, numerous military personnel entered the gun tower, potentially contaminating what could have been a crime scene, before he was taken away in a body bag. Another red flag for the family was that the military did not perform ballistics tests to determine whether it was possible he could have shot himself in the head as was suggested – with his M4 rifle muzzle up with the strap hanging loosely around his left leg. After his death, a sergeant took his weapon away from the scene, cleaned it offsite and dismantled it. It meant that there were no prints on it by the time it was properly examined. The sergeant, Armando Torres, was aware that Brown had started his shift seemingly incapacitated becuase he had been told by the two soldiers he took over from about his state at around 6am. He was in the dining hall when a different soldier ran in to tell the rest that he had been found dead but then rushed to the gun tower and planted himself there. Two days later, his body arrived back in Delaware in a flag-draped coffin. Only then was it taken to a medical examiner to undergo an autopsy which concluded he died as a result of a single gunshot wound to the head. It took the military more than a month to visit his mother, Sandra Evans, at her home in Northern California. By then, his death had been ruled as a suicide. She told the officers who visited her about his predication that he would be killed and expected them to include it in their investigation into his death. His role in the drug ring was to go to nearby Pakistan to get the drugs and bring them back onto the base for the sergeant to sell. He told his mother that he had told the sergeant he wanted out but that he refused and threatened him. The CID investigation into Brown’s death was closed in February 2009 without anyone ever being charged. Evans, despairing over the decision, has written to politicians including former president Barack Obama seeking further probing but nothing has ever been done. She then enlisted a lawyer to help put pressure on the military to reinvestigate his death after the files from his case started arriving at her home in the mail. They included gaping omissions, contradicting statements and a total failure of the CID to question witnesses about suspicious elements of the case, according to the family’s lawyer and Vanity Fair. In 2018, the case was reopened after Vanity Fair contacted the CID pushing for questions. It was reclosed four weeks later with the verdict remaining that Brown, who had absconded twice on cocaine binges previously, killed himself.